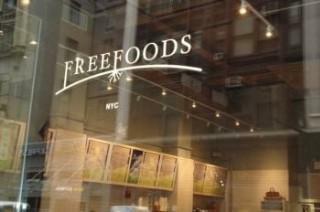 FreeFoods was founded in 2007 by Peter Schatzberg, Sid Veeramani and, Chef Matthew Kenney. The establishment provides innovative organic cuisine inspired by the seasons, while keeping a healthful diet in mind. The menu features organic and all natural cuisine featuring vegetarian, vegan, gluten-free and raw options. The menu is changing daily with the variation seasonal market availability. Wild seafood and organic poultry and beef, with compostable packaging and utensils (made from corn, paper and sugarcane). No plastic containers, cups are made from PLA which is a cornstarch-based polyester that’s biodegradable and made from a renewable resource. The restaurant composts a majority of their kitchen waste and avoid using synthetic materials throughout the store (marble countertops). FreeFoods provides their staff with organic cotton t-shirts and used as many natural materials in the construction of the store as possible.